Health insurance is likely the most expensive benefit federal employees will have in their retirement years. As you plan for retirement, you should carefully examine how the Federal Employee Health Benefits (FEHB) Plan and Medicare work together. While FEHB and Medicare generally complement each other in coverage, there can be gaps in coverage — particularly for custodial nursing home care. Medicare is the primary coverage for annuitants (and spouses who are covered under a self and family enrollment) who are age 65 or older. In this case, FEHB becomes the secondary insurance. For federal employees who continue to work beyond age 65 or older (and who are enrolled in FEHB), FEHB continues to be their primary coverage and Medicare is the secondary coverage. 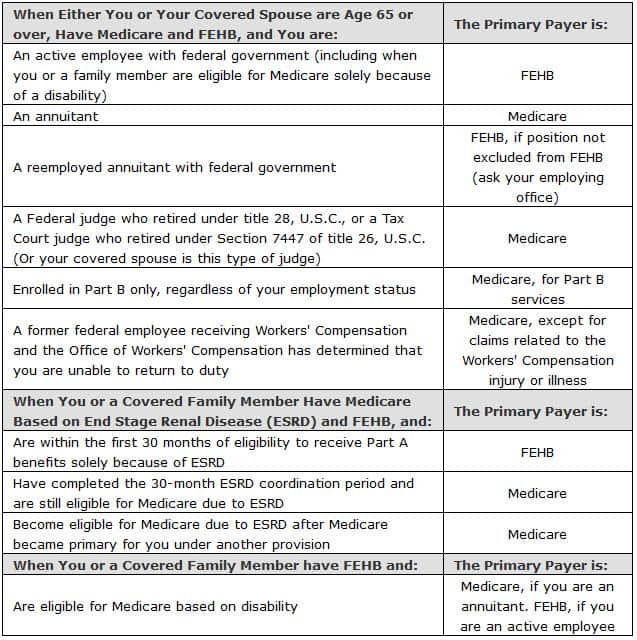 For a handy reference, please see the FEHB and Medicare Primary Payer Chart at the end of this article. Some people with disabilities, under 65 years of age. Part A (hospital insurance). Most people do not have to pay for Part A. If you or your spouse worked for at least 10 years in Medicare-covered employment, you should be able to qualify for premium-free Part A insurance. (Someone who was a federal employee on January 1, 1983 or since automatically qualifies.) Otherwise, if you are age 65 or older, you may be able to buy it. Part B (medical insurance). Most people pay monthly for Part B. Generally, Part B premiums are withheld from your monthly Social Security check or your retirement check. If you are eligible for Medicare, you may have choices in how you get your health care. Medicare + Choice is the term used to describe the various health plan choices available to Medicare beneficiaries. If you are eligible for Medicare, you may choose to enroll in and get your Medicare benefits from a Medicare managed care plan. These are health care choices (like HMOs) in some areas of the country. In most Medicare managed care plans, you can only go to doctors, specialists, or hospitals that are part of the plan. Medicare managed care plans provide all the benefits that Original Medicare covers. Some cover extras, like prescription drugs. To learn more about enrolling in a Medicare managed care plan, contact Medicare at 1-800-MEDICARE (1-800-633-4227) or at http://www.medicare.gov. Your FEHB health plan carrier brochure explain how they coordinate benefits with Medicare, depending on the type of Medicare managed care plan you have. If you are eligible for Medicare coverage read this information carefully, as it will have a real bearing on your benefits. The Original Medicare Plan (Original Medicare) is available everywhere in the United States. It is the way everyone used to get Medicare benefits and is the way most people get their Medicare Part A and Part B benefits now. You may go to any doctor, specialist, or hospital that accepts Medicare. The Original Medicare Plan pays its share and you pay your share. Some things are not covered under Original Medicare, like prescription drugs. Guide to Federal Retiree COLAs: What Are They and How Are They Calculated?